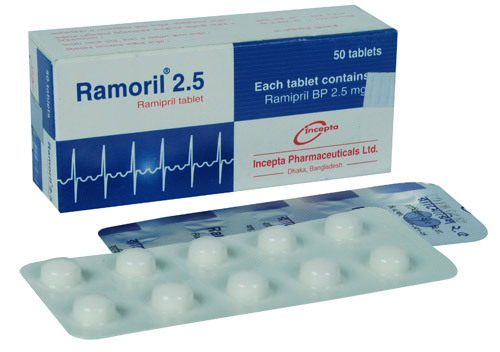 Ramoril 1.25: Each film coated tablet contains Ramipril BP 1.25 mg.
Ramoril 2.5: Each film coated tablet contains Ramipril BP 2.5 mg.
Ramoril 5: Each film coated tablet contains Ramipril BP 5 mg.
Ramoril 10: Each film coated tablet contains Ramipril BP 10 mg.
Ramipril is an angiotensin converting enzyme (ACE) inhibitor, which after hydrolysis to ramiprilat, blocks the conversion of angiotensin-I to the vasoconstrictor substance, angiotensin II. So, inhibition of ACE by ramipril results in decreased plasma angiotensin II, which leads to decreased vasopressor activity and decreased aldosterone secretion. 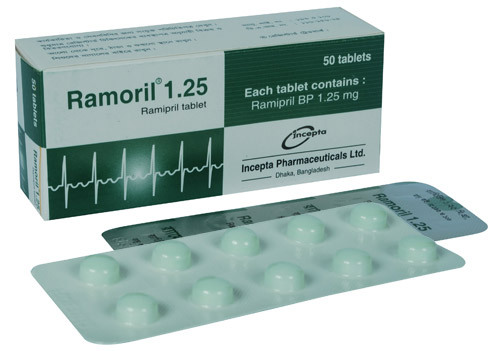 Thus ramipril exerts its antihypertensive activity. It is also effective in the management of heart failure and reduction of the risk of stroke, myocardial infarction and death from cardiovascular events. It is long acting and well tolerated; so, can be used in long term therapy. in patients with a history of cardiovascular disease. 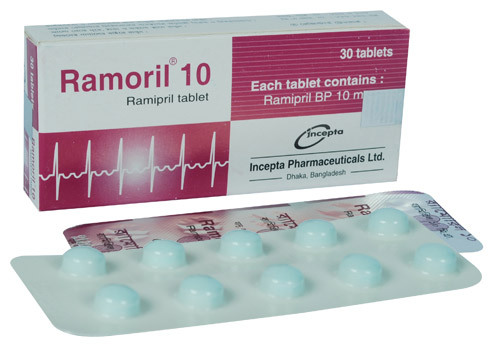 Dosage of Ramoril must be adjusted according to the patient tolerance and response. Hypertension: For the management of hypertension in adults not receiving a diuretic, the usual initial dose of Ramoril is 1.25 - 2.5 mg once daily. Dosage generally is adjusted no more rapidly than at 2-week intervals. The usual maintenance dosage in adults is 2.5 - 20 mg daily given as a single dose or in 2 divided doses daily. If BP is not controlled with Ramoril alone, a diuretic may be added. Congestive heart failure after myocardial infarction: In this case, Ramoril therapy may be initiated as early as 2 days after myocardial infarction. An initial dose of 2.5 mg twice daily is recommended, but if hypotension occurs, dose should be reduced to 1.25mg twice daily. Therapy is then titrated to a target daily dose of 5 mg twice daily. Dosage in renal impairment: For the patients with hypertension and renal impairment, the recommended initial dose is 1.25 mg Ramoril once daily. Subsequent dosage should be titrated according to individual tolerance and BP response, up to a maximum of 5 mg daily. For the patients with heart failure and renal impairment, the recommended dose is 1.25 mg once daily. The dose may be increased to 1.25 mg twice daily and up to a maximum dose of 2.5 mg twice daily depending upon clinical response and tolerability. Ramipril is generally well tolerated. Dizziness, headache, fatigue and asthenia are commonly reported side effects. Other side effects occurring less frequently include symptomatic hypotension, cough, nausea, vomiting, diarrhea, rash, urticaria, oliguria, anxiety, amnesia etc. Angioneurotic edema, anaphylactic reactions and hyperkalemia have also been reported rarely. 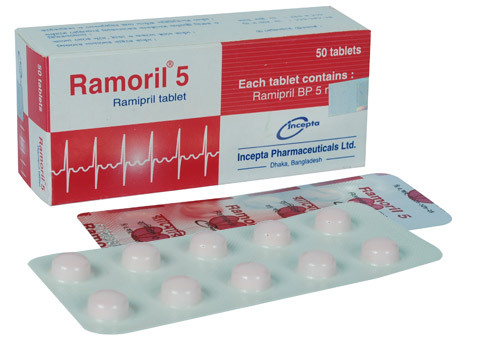 Ramipril should be used with caution in patients with impaired renal function, hyperkalemia, hypotension, surgery/anesthesia and impaired hepatic function. Pregnancy: Pregnancy should be excluded before start of treatment with Ramipril and avoided during treatment. However, if pregnancy is detected, Ramipril should be discontinued as early as possible unless continued use is considered life saving. Lactation: Ramipril should not be used during lactation. No information is yet available on the use of Ramipril in children.